The copy here is for information and archiving only, the original is the place to go for the latest information. Once upon a time .. I had a SYM-1 sbc board that I played around with. Wonderful microcomputer for its era (early 1980’s). Like most people due to non use and lack of interest I give that micro away. Since my recent eagerness to dabble with some of the older micros .. I had a go at trying to rebuild the SYM-1 to a reasonable design so I can use most of the SYM-1 features. 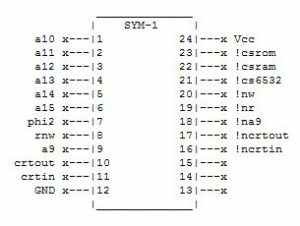 Having a 6502 chip and a 6532 peripheral chip, I had most bits to be able to create a minimal system to say run the SYM-1 Supermon 1.1 monitor. 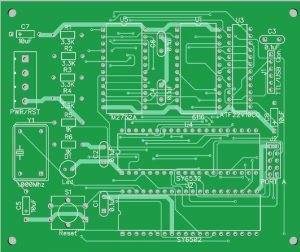 Following is a prototype that I got working (must admit after some testing time) which is minimal in design in having basically 5 main chips and TTL-USB adapter for comms to a PC. 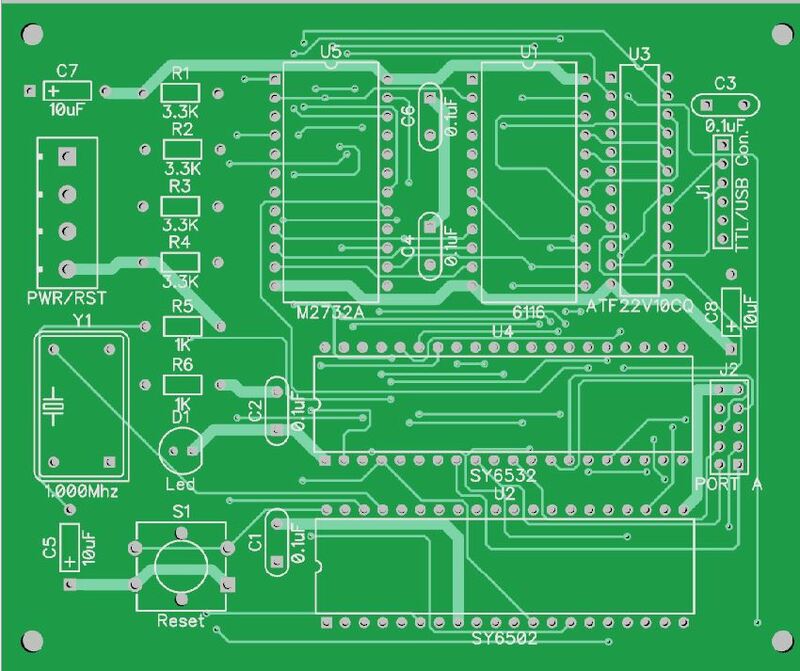 This project is ongoing where I have also reproduced (to a reasonable degree) an imitation keypad similar to the original one from individual pcb type push button keys. Where possible I used particular IC’s (like GAL’s) to minimise the construction and size of the design. 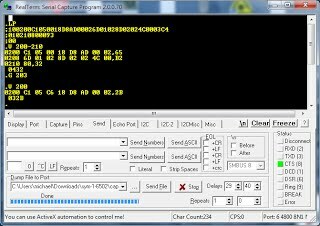 It mainly consist of the 6502 chip, 6532 peripheral chip, 2732 EPROM for Monitor, 2K 6116 Ram chip and 24pin Atmel GAL chip to provide some of the decoding and interfacing. 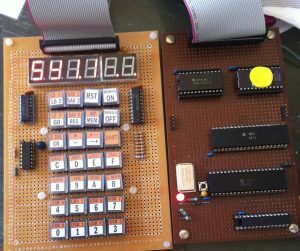 Additional things on the board are 14pin 1Mhz crystal and an expansion socket to be able to interface to display/keypad. 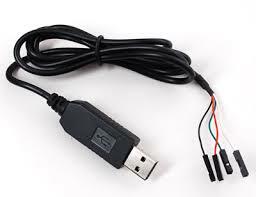 Flying wires are leads to a TTL to USB converter that connects to USB port of a PC. Monitor code is original version 1.1 that you can get from 6502.org. 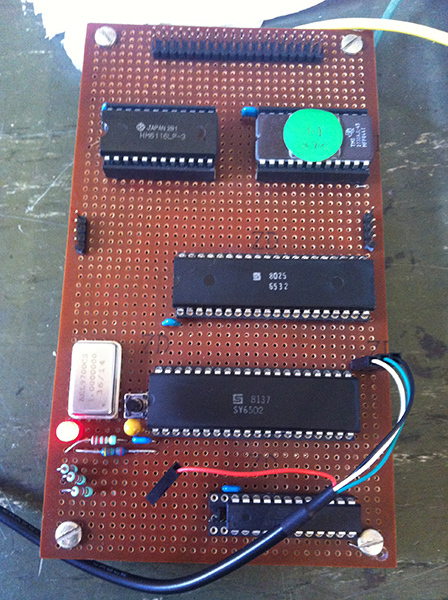 Memory map is original as per SYM-1 board for the monitor, 6532 chip and 2k RAM from 0000-07FF. Gal chip used is Atmel ATF22V10CQ/CQZ. No particular reason for this one .. but you can easily get them from RS components and not that expensive. I will provide the .pld and .jed file for the code to program these. See notes later on. 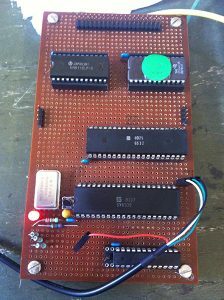 Prototype board was constructed using a vero type board with a bank of tracks to place the IC’s. Wiring was soldered point to point using wire wrap wire. After initial mounting of the components and testing for shorts etc the board was ready for use. When powered up the board draws about 220mA. See pic below. If you are an old micro buff you probably have some if not most parts to construct this mini board. In case you don’t here is few suggestions for major parts. 6502, 6532 you might be lucky enough to get them from China supplies (via Alibaba or Ebay website)..be prepared to wait 3-4 weeks at least. Atmel pdl (GAL chip) try RS components.. usually very quick delivery. If you cannot program pld’s I can supply the chip programmed. 2732 and 6116 try www.futurlec.com. If you cannot program the 2732 I can supply some Eproms as I have some spares left. Also look through some forums like this one. Original notes and references to RS232 on SYM-1 refer to 3 stop bits .. which confused me initially .. hence it took a while to figure out what works properly. Following is a schematic of the design. It is using Diptrace software. Note I use point to point schematic (pin ID connections). It does reduce wires ..but for some people it gets bit harder to follow. Caution: As with any circuit diagrams it is up to you to recheck and make sure it is OK before proceeding to any construction. To best of my ability this is representation of what I have used. 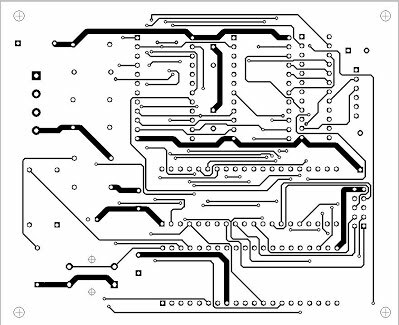 I’ve followed other circuit diagrams on the web, only to find some info was wrong. So please check pin outs (especially against datasheets) to make sure all connections are correct. If there is any errors please email me. Resistors are basically pullup resistors for inputs to CPU that are not needed. R6 and D1 are just power indicator for the board. S1 (on board pb switch), C5 and R5 are the reset input to 6502. Note also reset is provided from external input via terminal power block. 6532 is wired similar to SYM-1 schematic: A0-A6 for on chip ram addressing. CS1 is A10 and Register Select (RS) is via PLD chip. R/W is direct from 6502. 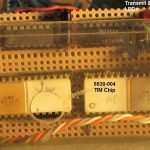 Chip selects for Rom, Ram and 6532 come from PLD. CRT OUT is inverted to RxData ..so is TxData to CRT IN via PLD inverter gates. 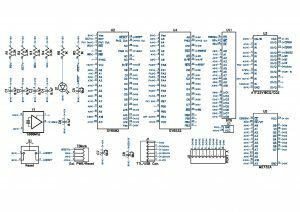 PLD provides address decoding and 3 inverter gates. Phi2 and R/W are used to generate RD and WR signals for Rom/Ram. 6116 and 2732 can be any brand as long as the pins are same. 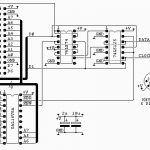 Also note which programming voltage is used for the 2732 chip, as they vary greatly. 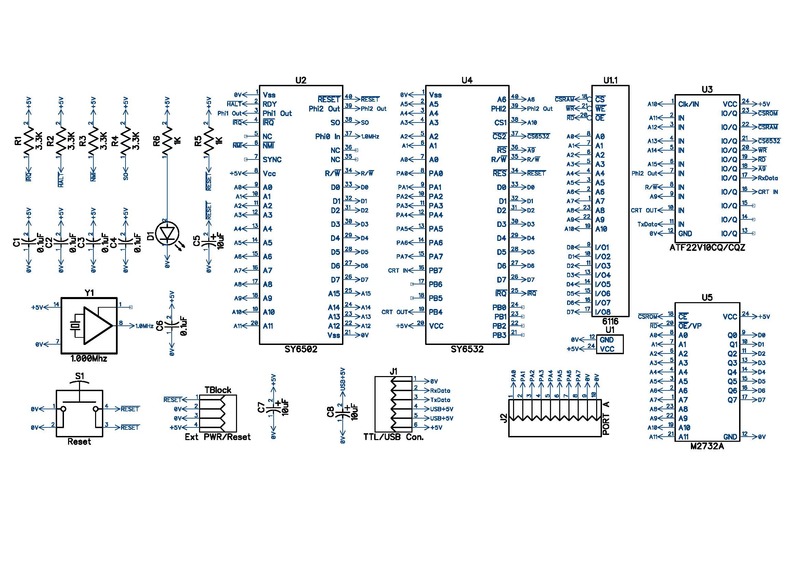 Atmel PLD is used to provide address decoding and 3 gate inverts for A9 and serial signals. For more info see Atmel website and WinCupl software. Obviously have the board connected to the PC and use appropriate comms software like Hyperterm (on XP) or RealTerm set to appropriate setting. Also set CAPS ON. (reduces errors). If all OK after pressing the RESET button …press the “Q” key on keyboard . The response should be “.” single dot …where you can give monitor commands after that. 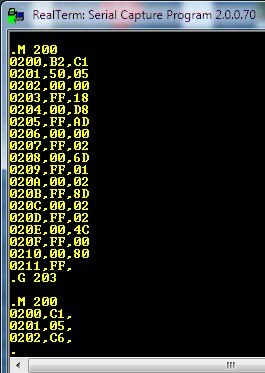 Following is snapshot of sample program that is given in Reference manual for SYM-1 that adds two numbers together from memory locations 200 and 201 and places result in 202. You can see that 202 changed from 0 to C6 which is = C1+05. From this point on you can explore all the monitor commands. Save and Load will not work as provision is not made in this design for saving code to cassette tape. So another way of saving and loading the machine code is via SP an LP (paper tape commands). and before you press , set terminal program to capture file mode.. which will save text as it is output to the terminal. Delete the space in first line and replace the “.” in the last line with “;00”. 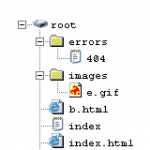 This creates the correct file to upload. 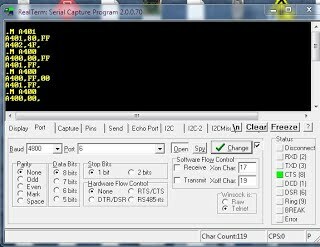 and send the captured file as text using terminal program ..What you might need to do is delay the character and LF output to about 20ms so the board does not get swamped with incoming characters from the PC serial port. You can adjust the delay to smaller value till the sending of file stops working properly. 20ms+ is usually a safe bet. Picture above shows loading of the file, listing the code, running it and then listing the result of the addition program. 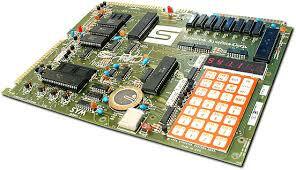 So there you are ..plenty of things to be able to examine ..with minimal system similar to the original SYM-1 board. Ok If you are to use the mini board with RS232 interface only (that is … with NO keypad/display) then the port A (address A400) is free to use for any I/O control. The DDRA (address A401) can be set up for output or input. As a simple example using SYM monitor we can set the DDR to output on all eight PA pins (set DDRA to FF). Then changing the value of I/O Register A (A400 address) from FF to 00 will toggle output on the port A (pins 8-15) from high back to low. If you want to use the port A as an input then set appropriate bits to 0 in DDRA. Image below shows a crude example of control via Monitor commands. 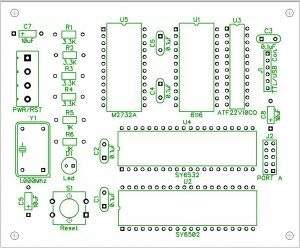 Writing machine/assembly code for more complex task is possible and make the board useful as a micro controller. Changed binary file Supermon 1.1 file for 9600 baud can be downloaded from here. Please note as suggested, once this is changed it might not be possible to run the board at different speeds. If you are like me I am not best at bread boarding circuits. 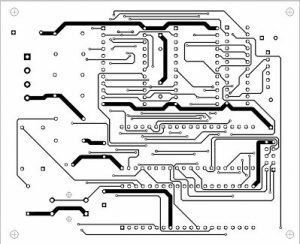 From the mini board schematic diagram I have generated a pcb design and gerber files that you be able to make your own boards from. See link below. 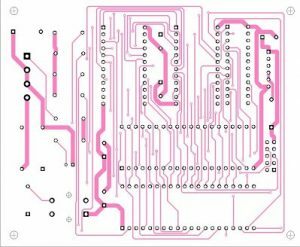 I have not made any of these pcb’s so make sure you check the board out before any component mounting. In case there is any major faults let me know. One mistake that I am aware of is that the polarized caps C5,7 and 8 show the “+” on the wrong side. So make sure you mount polarized caps the correct way around. When I get time will try to correct that. At this point I am only providing the full set of the gerber files from which you can get the boards manufactured. 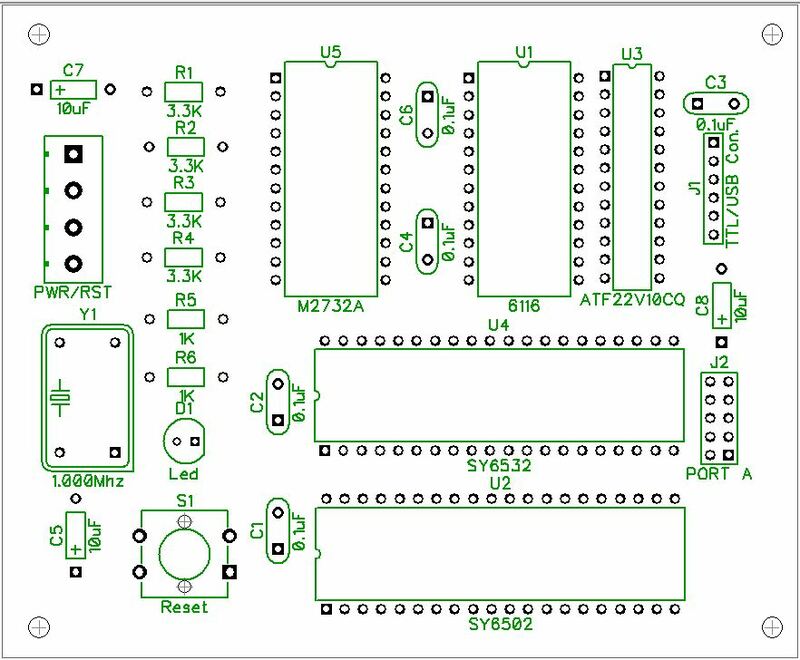 From more expensive pcb websites the board will work out about $30-$40 .. but if you shop around and get more than one board ..they will probably work out $10-15 each. Most of component placement is self explanatory. It is possible to power the board from TTL/USB connector (by getting +5 volts from PC USB port). But word of caution in doing that. The setup draws about 220mA, so make sure all the connection on J1 are solid. Also if you to use USB power then do not power the board from PWR/RST connector. Download set of zipped Gerber files here. The only issue with these switches is that they had too much horizontal (rotational) play and hence keys do not look all lined up. 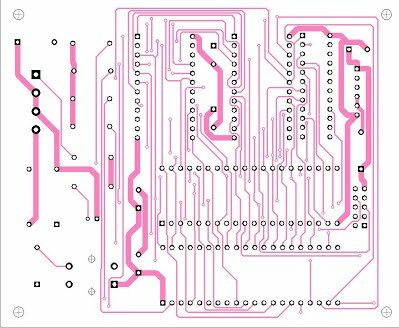 Placing the keys close would eliminate some of that, however mounting the switches on the pcb requires some distance between adjoining pins – so it is not possible to bring the rows close together.